Some people make a distinction between cues and aids, stating the cues indicate what a rider wants of the horse and aids help the horse to do it. Such distinctions may prove confusing, especially when all people do not use the terms in the same way. The important thing is to think of cues or aids as communication. The better one communicates the easier it is for the other party to understand what the communicator is trying to say. Cues may take many forms: auditory, tactile, and visual. 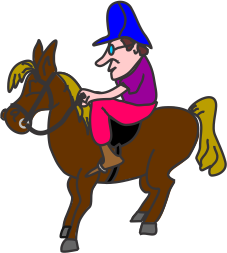 When riding the cues are generally auditory or tactile. Verbal cues are particularly useful in transition from ground work to riding. If a handler employs ground work as a way of training a horse before introducing the horse to being ridden, it makes sense that he would use verbal cues along with any other cue when teaching a horse something. Then, when riding, the verbal cue may be used to help interpret the meaning of the new cue being presented from the horse's back. How a verbal cue is presented — the rhythm, tonality, volume — may be even more influential than the words used. Tactile cues include the use of balance, weight, and pressure. These three are often related and used in combination. 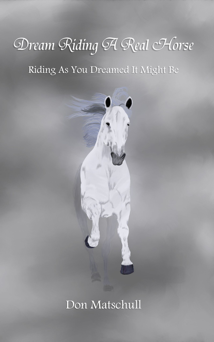 For example, if a rider changes his balance by leaning slight forward or rearward, the horse will feel a difference in where pressure is applied by the rider's weight distribution. Such cues are most effective and reach the ultimate in subtlety when a rider is sitting well as described in the section on the seat. Pressure may be applied either directly or indirectly. Pressure is applied directly by a rider's seat and legs. Pressure is applied indirectly by use of such devices as reins, bits, spurs, whips, and crops. Again, pressure should be used to communicate, not force a horse to move in a particular way. Pressure may even be used by its removal. For example, a rider may remove the pressure of his leg on the horse caused by the effects of gravity as when he uses the technique of "opening the door". Release of pressure also serves as a reward — a way of saying, "You did the right thing." This is done when pressure to initiate a movement is relieved as soon as the horse begins to respond. An example of this may be seen in the use of reins when stopping. While a horse should respect spurs and whip, he should not be afraid of them. Ideally, spurs should be used to touch the hair and not the skin. The whip may be applied behind a rider's leg to reinforce the leg cue, but it may also be used to tap here or there as an indication of what the rider wants. Cues may be executed as whispers rather than shouts if both rider and horse are relaxed. 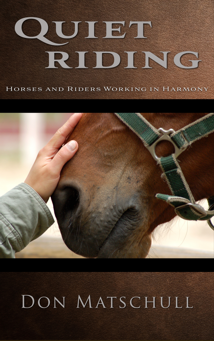 This requires a that the horse and rider have a good understanding of one another as discussed in the section on relationship. When observing a rider, you should understand that a horse's response to a subtle cue may not be the result of a willing horse. It may be the response of a fearful horse. General observation of a horse's bearing and way of moving is often an indication of how the horse was trained. How a rider sits can greatly influence how a horse perceives the rider's cues. The better a rider sits, the more attentive his horse will be. When a rider sits poorly, it is often more difficult for the horse to perform the action the rider is asking the horse to perform. Anyone who has ever carried another individual on his back or shoulders should realize that the better that individual was balanced, the easier it was to carry him. Also, the quieter that individual sat and the better he moved with the movements of the one carrying him, the easier he was to carry. A rider who wants his horse to be responsive to subtle cues should generally be seated with his center of gravity over his horse's center of gravity. He may, then, easily shift his seat in any direction to influence his horse's movement. The rider's seat may be positioned differently for specific purposes. However, the basic seat should be one in which the rider is aligned with head over shoulders over hips over heels. This may be thought of as the basic starting position similar to the hands of a pianist or typist. Good posture can best be achieved by relaxing rather than tensing the muscles. If the rider releases the tension in his muscles, the bones of his spine can stack easily one above another with natural, shock absorbing curves. The rider's skeleton will then support the rider's weight with very little muscular effort. The muscles, then, can respond quickly and subtly when needed. When the rider releases tension in the muscles around his pelvis and throughout his legs and feet, his center of gravity drops and his seat becomes more stable. His relaxed seat settles deeply into the saddle. His legs wraps softly around his horse's sides without squeezing. The stirrups support the balls of his feet, but his heels sink lower — again, without muscular effort. From this relaxed and balanced position, the rider is free to easily perform changes that can be used to direct his horse's actions. In addition, when the rider is relaxed and balanced, the horse is more likely to relax and respond more easily to the rider's directions.